We only meet these ancient inhabitants of Estonian nature on the mainland. They stay close to their nest areas throughout the year. In these spruce-mixed forest habitats where alder, birch, aspen and hazel grow they feed in winter on the buds, catkins and shoots of hazels. The pairs that formed during the autumn display in September-October may sometimes keep company during the whole winter. After the autumn moulting the juveniles that hatched last summer already look like the adult birds. 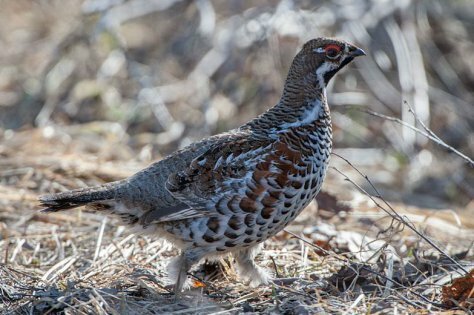 The hazel grouse is a Galliformes or hen-like birds with a small head but a sturdy body. The males and females are similar in size, weighing about 300-400 grams or a little more. Body length is under 40 centimetres, the wing span in flight half a metre. On taking flight a characteristic whirring sounds from the wings (those who have heard it will know); it is a question how these only pigeon-sized birds can create such a sound. But all the Galliformes birds in Estonia take flight noisily. The back plumage of hazel grouses is grey with darker brown and grey dots. The underbody is lighter and patterned with black or chestnut brown flecks. The wings and sides have rust-brown patches, the toes are covered with fringes in winter - makes it easier to forage and to clamber on icy branches. On the throat of the male we can see a large black patch framed in white; bright red eyebrow stripes above the eyes and a neck crest. The eye colour of all is reddish-brown, the little beak black. The throat of the female is whitish, the neck crest only to be guessed. The whole plumage seems to be a little bleaker. Wnter numbers may be estimated at 50 000 to 100 000 individuals and they can be attracted by a grouse whistle.